A few years ago I examined a Ph. D. on artists’ houses. The thesis was something of an intellectual departure for me – written by a candidate whose background is in museums rather than literary studies. The thesis explored how houses augment our understanding of the artists who lived there, arguing that the experience is powerful because it engages all our senses. As we move through the spaces in which an artist worked, we are assailed not only with myriad visual images, but sounds, smells, and the suggestion of tastes. Even the almost universal prohibition against touching does not prevent our intuiting how a room and the objects in it feel. This is a knowledge that depends on our being physically present, providing information that cannot be acquired from secondary written or pictorial records. The idea of an artist’s home as a three-dimensional and multi-sensory archive feels right to me. We are sensate beings and our perception depends on a range of factors. Experiencing first-hand the colourful and exuberant art with which Vanessa Bell decorated almost every inch of her house at Charleston made me question biographical accounts of her life that depict her as silently restrained. Imagine then my feelings when I visited Shakespeare’s birthplace in Stratford-upon-Avon last month. After paying my entrance fee, I was herded into a blackened room where I was confronted with a large screen. Closed elevator doors informed me they would re-open only when whatever it was that was to happen had ended. I was trapped in the room with perhaps thirty other visitors. We were shown a film with voice-over accompanied by computer-orchestrated multi-media effects. When the doors finally released us, it was into a second darkened space. I am not sure how many such rooms we endured – but by the third I started to wonder if (instead of Shakespeare’s birthplace) I had inadvertently stumbled into an Orwellian proles day out from 1984. The glossy brochure advertising the presentation describes it as a ‘state of the art’ introduction to Shakespeare. For me, it was an abomination – for several reasons. None of the largely Spanish-speaking group I was held captive with could follow the English soundtrack (there may have been the option of an alternative language, but if there was no one in the group seemed to have understood this). Yet they still had to suffer the full sequence, film by film: escape was impossible. Then there was the elderly woman searching in vain for somewhere to sit while the performances lasted. None of us had any idea how many rooms there were and consequently how long she would be required to stand for. What might have been a highlight – a chance to see a copy of Shakespeare’s First Folio – became a frustration because before I could take my turn, the computer-timed spotlight on its glass case had switched off and our attention was directed elsewhere. In the final room, the visual display was not working and we spent the allotted minutes staring at a computer error message before the doors allowed us to leave. I wondered if pressing the return key might solve the problem – but there was no staff member to ask. 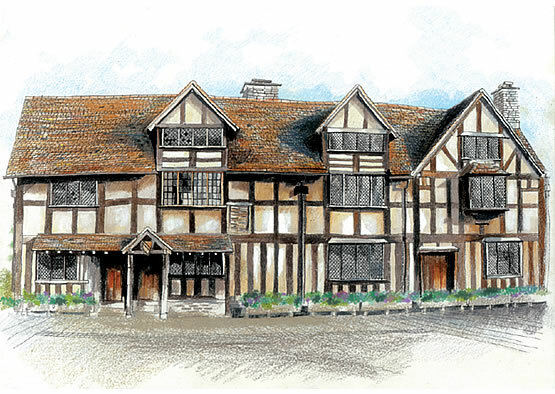 The real crime of this introduction to Shakespeare’s birthplace is its assumption our experience is homogeneous, and that consequently our visits can be managed by a one-size-fits-all computerised show. I appreciate that for some the information relayed and the special effects will register differently – but for me it remains a sad indictment of mainstream culture at its most pernicious. How Adorno would have hated it! Far from encouraging us to engage in a dynamic and multivalent way with the home of one of Britain’s greatest writers, what this ‘state of the art’ performance demands of its audience is a necessary, deadening passivity. It seems particularly ironic that this should happen to Shakespeare….